B&W Photo shot with Tri-X film. I was working with contrast and form when I shot this photo. 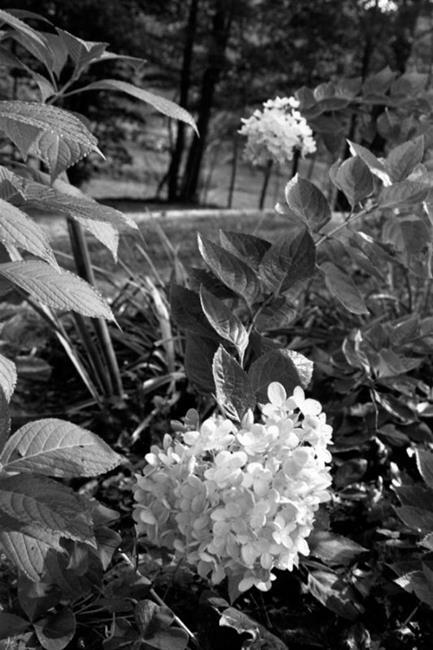 Now it has much more sentimental value as the spindly little Pee-Gee Hydrangea blooming in this photo is now becoming a good sized tree and had to be moved from the garden some years ago. The leaves on the far left are part of a bigleaf hydrangea which is now a monstrous shrub. This garden has changed alot and it's nice to have a photo of it when it was nearly new.